No parent wants to witness their child in pain. 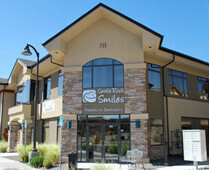 Castle Rock Smiles understands how urgent it is to relieve mouth pain, especially when it’s your child’s tooth. To avoid feeling helpless and frustrated because you don’t know how to handle your child’s toothache properly the one day it randomly strikes. Your children’s emergency dentist in Castle Pines wants you to stay prepared. Here’s some helpful information that will help you to pinpoint your child’s tooth pain, alleviate it, and ultimately follow up or seek additional assistance at Castle Rock Smiles. Identify the area that’s in pain. The first thing you should do when your child is complaining about a toothache or mouth pain is to identify what’s causing it. If your child is old enough, they can point out where the pain is or possibly identify the cause themselves. It’s when you child is younger that you must keep an eye out for signs of red, swollen gums, cheeks or cavities that appear as darker spots on their teeth. Pin point the source of the pain. Unfortunately, tooth pain can be tricky. Not all toothaches are caused by the same thing. A young child may bite their tongue and describe it as a toothache because they associate that with general mouth pain. Some children have sore gums from development or even develop ulcers in their mouth from a change in diet. But, if a tooth is discolored, broken, loose, or has either dark or light spots, that is most likely what’s causing your child’s pain. A quick way to relieve pain is by flossing. Help your child floss to remove any food particles or dental debris that may be lodged between their teeth. Rinse their mouths with warm salt water. Salt water will help to relieve pain and disinfect an area that may be open and susceptible to infections. Use a cold compress to alleviate pain and swelling if it’s present. Apply the cold compress with a gentle pressure for 15 minutes, then off for 20 minutes. If they’re old enough, you can give your child either ibuprofen or acetaminophen (both act as inflammatories). Be sure to read about dosage and administer the correct amount. Understand when it’s a dental emergency. If your son or daughter is experiencing a strong throbbing pain, severe fatigue, or a high fever, or trouble breathing/swallowing, it’s an emergency. Dr. Benzley encourages you to either bring them to the ER or call their pediatrician as soon as possible, especially if they have a fever or trouble breathing. 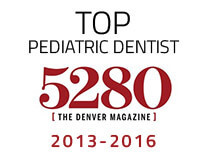 Of course, your Castle Pines dentist would prefer that you visit our dental practice, but if your child’s toothache is far gone, your child may need additional medical attention. Anytime your child is experiencing tooth pain, you should call our office. Even if it’s not a severe toothache, their tooth pain could be an indicator of another dental problem. We can help you keep you and your family from experiencing dental pain in the long run by checking on minor dental issues now. Call us to schedule an appointment today.